The joys of jet lag…. I have just got back from a fabulous holiday…three weeks of pure bliss. I am such a lucky girl…Bangkok, Koh Samui and Singapore in one holiday. Luckier still, the Bangkok leg of the trip was sponsored by the Royal Thai Embassy in Pretoria, who arranged an invitation to Bangkok Fashion Week as well as a few days at the world famous Blue Elephant cooking school. After all the holiday fun comes the work – I am now way behind on my blogging. But for now, I am going to jump the queue with this blog because this recipe needs to be shared with the world! In the last week I have dealt with my jet lag troubles by indulging in a few decadent treats. On Sunday morning I woke up at 3am, and after spending an hour tossing and turning in bed I decided to get up and do something useful. I briefly thought about watching a movie, reading a book, or sewing a dress. I decided instead to fulfil an early morning craving for home-made croissants – light and delicious freshly baked pastry was what my troubled tummy was calling for. So at 4am, with just the afghan hounds for company, I tiptoed downstairs and crept into the kitchen. An early morning start is always enjoyable once you are up, and it also meant the croissants were ready for tea at 3pm. I always keep a stash of Spar butter in the refrigerator so I don’t break the bank when I make these. 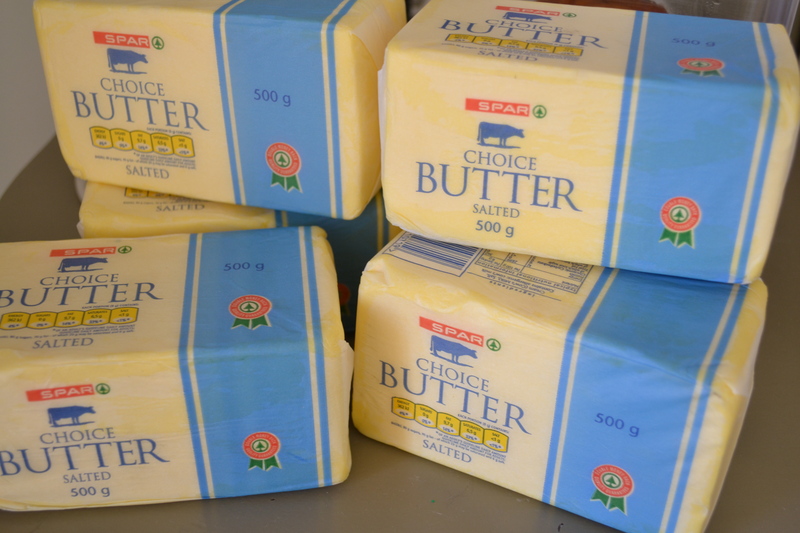 I love cooking and baking with butter and maybe you have noticed that it has become quite expensive. If you are going to give this recipe a bash – stay away from the margarine….it just won’t work! 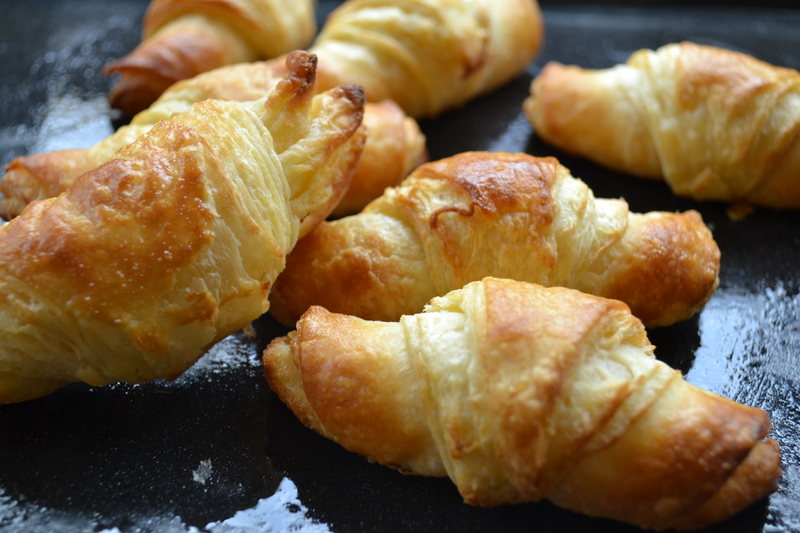 Here is my recipe for Butter Croissants…. Sift the cake flour into a large mixing bowl. Add the yeast to the sifted flour. Dissolve the salt, sugar and milk powder in 100ml of the iced water. Stir the ingredients into the iced water. Make a well in the flour and pour in the iced water mixture. Use your fingertips to work the flour into the liquid. Slowly add the remaining iced water taking care not make the dough too sticky. Knead the dough lightly and then leave to rise in a warm place for 45 minutes or until the dough doubles. Knead the dough for a few seconds and cover with plastic wrap. Refrigerate the dough for 6 hours. While the dough is resting, lightly cream the butter. Leave the butter in the refrigerator to chill – it should be cold but not hard. Place the butter on grease proof and work it into a 10cm x 10cm block. Remove the dough from the refrigerator and then roll into a large rectangle. Place the butter block diagonally over the centre of the dough. Fold the edges over the butter ensuring that it is properly enclosed with the dough. Roll the dough into a large rectangle. Fold top third of the dough over the middle section. Fold the bottom third over the middle section. Wrap the dough in cling wrap and refrigerate for 20 minutes. Place the dough on a lightly floured surface with the folded flap facing right. Roll out the dough out and repeat the process twice more – The dough must rest for 20 minutes in the refrigerator each time. Roll the dough into a large rectangle and cut out 2 x 35cm rounds. Use a ruler to mark each round into eight ‘triangles’. Refrigerate the triangles for 20 minutes. Roll each triangle starting at the base and tuck the point under the roll. Gently curl the roll into a crescent shape. Leave the rolls to rise at room temperature. Beat the egg with 5ml cold water. Brush the croissants with the egg mixture. Bake at 230 degrees celsius for 10 – 12 minutes or until golden brown. 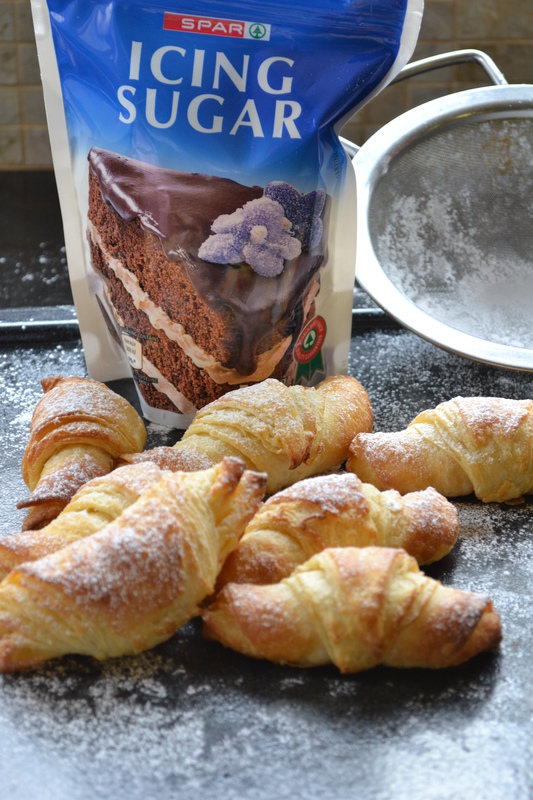 Dust the croissants with icing sugar when they cool down.